Original psychedelic sounds featuring members of seminal cult bands Red Guitars, Dead Fingers Talk and The Planet Wilson. Who’s in Loudhailer Electric Company and what do you all play? 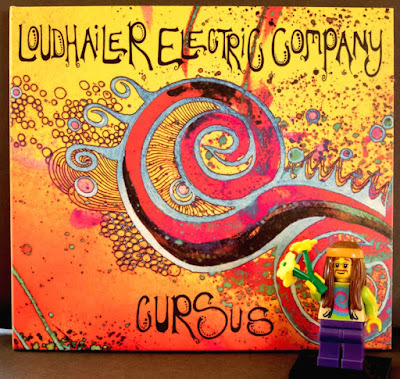 We’re Loudhailer Electric Company – original psychedelic sounds featuring members of seminal cult bands Red Guitars and Dead Fingers Talk. 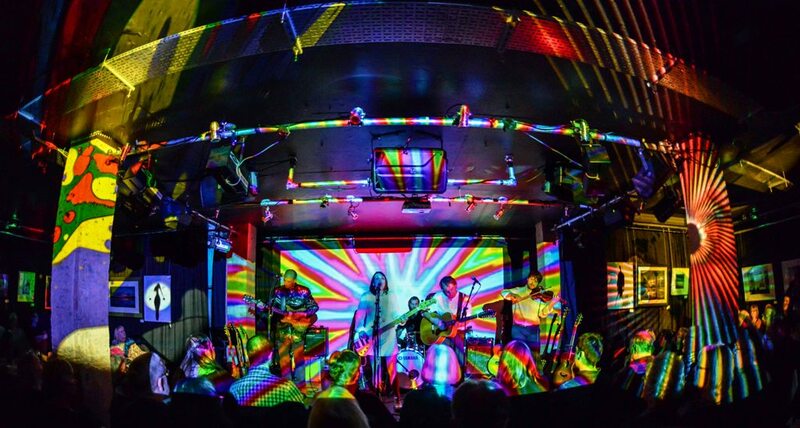 We’re a band of many backgrounds and ages, ranging all the way from 25 to 65 with all sorts of influences, but altogether we have a love of all things psychedelic. I’m Lou Duffy-Howard, I’m the band’s vocalist and bassist – and occasional acoustic guitarist. Instrumentally bass is my first love. I’ve got a gorgeous black fretless Music Man Stingray from the 1970s, and a fab 80s fretted Cutlass with a carbon graphite neck. They’ve both had a lot of play and I’ve just replaced them with a new white Music Man Caprice with a maple neck, I love it. In the 80s I had lots of fun playing bass in original indie band Red Guitars. We were best known for our No. 1 Indie single “Good Technology” and Independent album Slow To Fade before we signed to Virgin Records. Richard Duffy-Howard – Rich and I write the songs together. He’s a former space age trance world dub band poet. Rich is the spoken wordsmith in Loudhailer Electric Company, he plays acoustic guitar and jumps in on bass on a couple of songs. Jeff Parsons – Jeff is our stunning lead guitarist, his official title is Keeper of the Sacred Flangector. Back in the late 70s he was guitarist in the seminal gritty post punk band Dead Fingers Talk who’s first album was produced by the late great Spider From Mars Mick Ronson (who really came from our home town of Hull UK). His early influences were American psychedelic bands and The Who, and he’s a big fan of The Church and The Chameleons. Jeff plays his guitar upside down. He’s got an array of awesome sounds and styles and a few tricks up his sleeve which send the Loudhailer Electric Company into orbit every time. Rich Walker – Rich is a real feel-the-groove style drummer. He gets into the zone and plays some very unusual light handed funky jazz beats with occasional colossal fills that go over maybe four or even eight bars. Our first violinist was Amanda Lowe, also known around the world as a superb hammer dulcimer player. Mandi was fabulous in the band, but was busy so Chris stepped in before we recorded our debut album. Our ages cross a couple of generations so we all have very different experiences. There was a lot of music in my family as I was growing up although I didn’t learn to play until I picked up the bass as a teenager. My mum’s family are mostly classical musicians and my dad liked opera, but they only had four albums that I remember, Tom Paxton’s 1964 debut album Ramblin’ Boy, Blood Sweat and Tears eponymous 1968 album, The Beach Boys Greatest Hits, and a 1964 collection of traditional Northumbrian songs and tunes by Isla Cameron, Bob Davenport, Jack Armstrong and The Rakes. I can see now how all of those albums shaped my musical mind. The first live band I saw was on David Bowie’s Ziggy Stardust tour when I was 13. The musicianship of Ronno and the Spiders and the spectacle of the show blew me away and that was the day – Friday June 29th 1973 – I decided I would play an instrument in a band. When and how did you all originally meet? When did you decide that you wanted to start writing and performing your own music? Rich and I played as an acoustic duo first, and although we’ve both played in bands previously our collaborative writing was easy and natural right from the beginning. Lyrically, one of us will often have an idea or write the first draft and the other will shape it up. We used to have a theme whenever we played a special gig, so we had a set of Sci Fi songs, a set of Road Movie inspired songs, and more recently wrote and released The Auricula Suite, an album of songs telling a re-imagined story of a historical journey to a new land, inspired by folk tales of the alpine flower – the Primula auricula – and its 16th century journey to England with the Huguenot refugees. 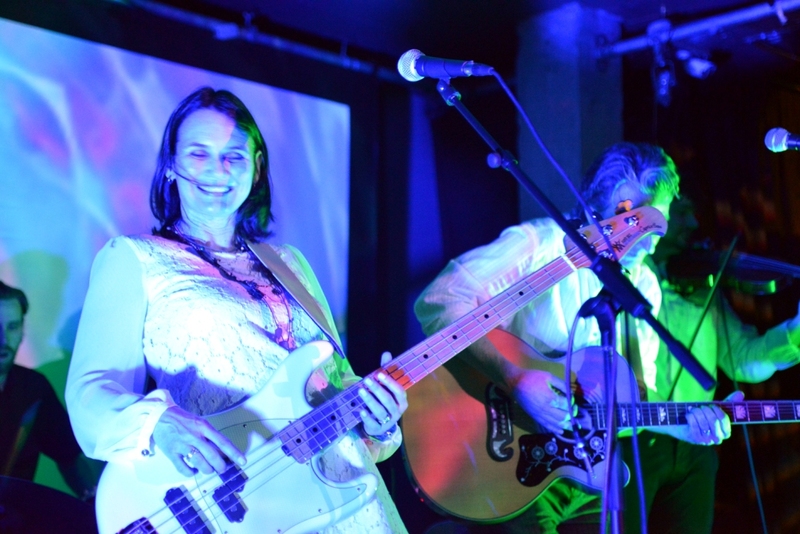 The Auricula Suite album features the hurdy gurdy and hammer dulcimer of Quentin Budworth and Amanda Lowe. Some of our songs are linked to our favourite writers and films. So, “Hawk Moon” – on our new album Cursus– is our tribute to Sam Shepard’s Motel Chronicles and Hawk Moon. We both love Richard Brautigan’s books and poems. We were totally thrilled that our song “American Dust” – our tribute to his novel ‘So The Wind Won’t Blow It All Away’ is included in the Brautigan archivist John F Barber’s most excellent essay about the book. The essay and our song is published in the Honest Ulsterman, seminal Northern Ireland literary review magazine created by the late poet James Simmons in May 1968, when Paris was teetering on the brink of revolution and Northern Ireland, civil war. There’s a funny story too – we come from Hull where poet Philip Larkin worked in the Hull University Library. Evidently, picking up a copy of The Honest Ulsterman there in the early 1970s, Philip Larkin was said to have gasped in horror, “Good God, do we subscribe to this?” How cool. Between 2000 and 2008, as well as writing and performing, Rich and I ran an annual free festival, Grassroots Free Festival together with our friend, hip hop performer, David Okwesia (Full Flava). 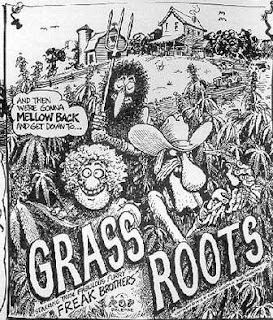 Not many people knew this, but the name of the festival came from a Fabulous Furry Freaks cartoon. We left the hip hop side of the festival to Dave and Rich and I managed the stages and Tipi Village. By the last year we had six stages and sound systems. William Nowik came over from New York to play on the world music stage one year. We really hit it off and invited him back to Hull to play with our Kurdish musician friends in the city at a special event we put on as part of the Humber Mouth Literature Festival – Independence Day. The experimental New York songs and stories of William Nowik and Kurdish music and dance from Gul Naz and Nahro Zagros, culminated in me, Rich, William and violinist Nahro performing a collaborative finale of William’s Wars & Forays and our Night Heron. The whole evening was a fascinating union with the Kurdish band celebrating the American invasion of Iraq and hope of independence and William – an American – opposed and protesting to it. But everybody joined together and danced. William came to stay with us. We kept in touch when he went back to New York State, and became good friends. William may tell you this story in more detail, but we had our flyers for the Independence Day gig printed in Kurdish and Arabic as well as English. When William was back in New York he had an Arabic flyer in his pocket when he found himself in a Kurdish part of town and a conversation about the flyer led him to live in Afghanistan during the war where he travelled, making films and music along the way. What does the name “Loudhailer Electric Company” refer to in the context of the band name? The Loudhailer part comes from how I shorten my name. Lou Duffy-Howard is so long I usually just write Lou DH. The Electric part is because we plug in and play loud and the Company was a serendipitous mistake when the owner of the legendary Hull New Adelphi Club Paul Jackson -a very well respected guy in the music scene here – accidentally billed our Loudhailer Electric open mic night as Loudhailer Electric Company. So, Paul Jackson thought up the name – although he probably doesn’t realise it. In other bands I’ve been in we’ve spent ages going through all sorts of terrible ideas trying to think of a band name, but Loudhailer Electric Company was the only name we thought of, in fact, it came before the band. What happened was that Rich and I originally used the name Loudhailer when we play acoustically – Rich & Lou’s Loudhailer. We also host an acoustic night -an acoustic open mic night called Loudhailer Acoustic. We invited our guitarist friend Jeff to come along to play and he became a regular. About three years ago we decided to start an electric open mic night and had a pilot night at the legendary New Adelphi Club here in Hull. It was an electric version of Loudhailer Acoustic, so, Loudhailer Electric. Rich and I put together a jamming band to close the show and invited Jeff to join us. Jeff invited his mate, drummer Rich Walker and we played Space Dub Jam, a groovy jam in E minor. We all clicked together and loved it. The jam band had such a good time we stayed together. 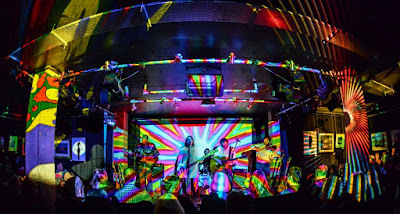 My friend from Celtarabia Amanda Lowe joined us on violin for the first few gigs but she was too busy so we asked violinist Chris Heron to join and that was that – Loudhailer Electric Company was in orbit! What’s the songwriting process like? Can you share some further details how your latest album Cursus was recorded and released? I cycle everywhere and usually have something going round in my head while I’m cycling along. I wrote some of my favourite songs on my bike – “On the Run” and “My Ancestors” were French for example were both written in my head between town and home. When Rich and I write the lyrics together, one of us will start something and the other will add something or mix it up. We wrote “Silver” – which will be on the next album – by text message. Jeff has a wealth of guitar licks and sounds up his sleeve which never fail to take the songs into space. I love it when Rich’s rhythms and Chris’s violin bring it all together to make the whole greater than the sum of the parts. We wanted a live natural sound for the album. We love jamming and wanted to keep it loose and free enough to have some improvised sections, so we recorded it as live as possible. In the 80s there was pressure from record companies to record the life and soul out of everything – click tracks, hundreds of takes, composite tracks rather than feel good whole takes – but we could do just what we wanted to do, so we got a good live groove and kept as much of the bass, drums and rhythm guitar as we could before we added the guitars, violin and vocals. Jeff knew exactly what he was doing and really came up with the goods, I love his guitar throughout. Chris too, we had a great time in there. I sang most of the vocals late one session. If there’s anything I could spend too much time on it would be backing vocals. I really enjoy stacking them up and could go on forever. We decided to release the album on our own DHM record label. We have a digital distribution deal with Label Worx who distribute nearly 10,000 independent labels. They happen to be based in Hull too, so it’s good for us to keep it local. So the album is available from all the usual digital outlets. Rich and I don’t use the digital outlets to listen to music though. We don’t have Spotify – the artists get paid virtually nothing. But it’s tricky. We decided to have our releases available on Spotify etc. for now. At the album release gig two guys told us they heard about us through Spotify and then came to the album launch, loved the gig and bought albums each so maybe it’s worth it for that sort of thing. We don’t have iTunes either. I deleted it because as a music creator I don’t like the way it messes with your files. My favourite platform is Bandcamp and we sell CDs and merchandise there. The ‘behind the scenes’ database and support files part of Bandcamp are excellent. We recorded the Loudhailer Electric album Cursus at Fairview studio in Willerby near Hull, where I spent many happy hours recording the first Red Guitars album, Slow To Fade. 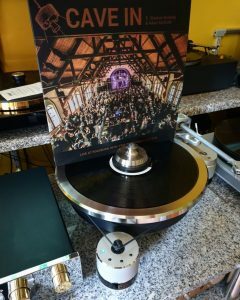 The sound and mastering engineer there, John Spence invited us to record an exclusive track for the studio’s 50th anniversary celebration last year. We are amongst good company with the likes of Michael Chapman and Bill Nelson. We had such a good time recording a funky number – “Underneath the Underground” – that we decided to go back and record our whole album there. John did a brilliant job and we loved the process and the end result. John’s a great mastering engineer too, but it’s always good to have a different pair of ears involved, so we went to Pete Maher who has recently mastered U2, The Pixies, Jack White, The Rolling Stones and Lana Del Rey to name just a few. Pete used to live in Hull as it happens, although we never crossed paths then. He was very complimentary about the album and the recording bandwidths and sounds. He did us some fabulous masters for vinyl too. There’s a trend to highly compress everything and make it as loud as possible, but we wanted a natural dynamic sound which the album really does have. The cover artwork is very beautiful. Thank you. It’s an original work by Charlotte Pugh. 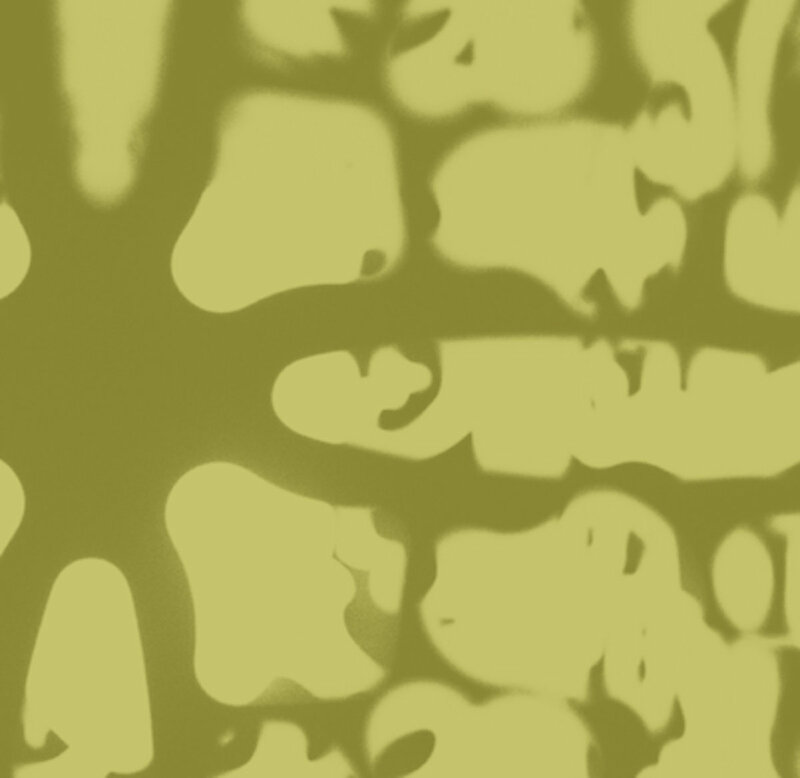 All I knew about the album artwork – in my mind – was that it would be primarily yellow. I met Charlotte when I played in the York Gamelan Orchestra with her last year together. She is a very experienced Gamelan player and beautiful psychedelic artist. I saw her work and knew it was perfect for our album. Charlotte has already done the artwork for out next album, it’s the first part of the album to be ready! 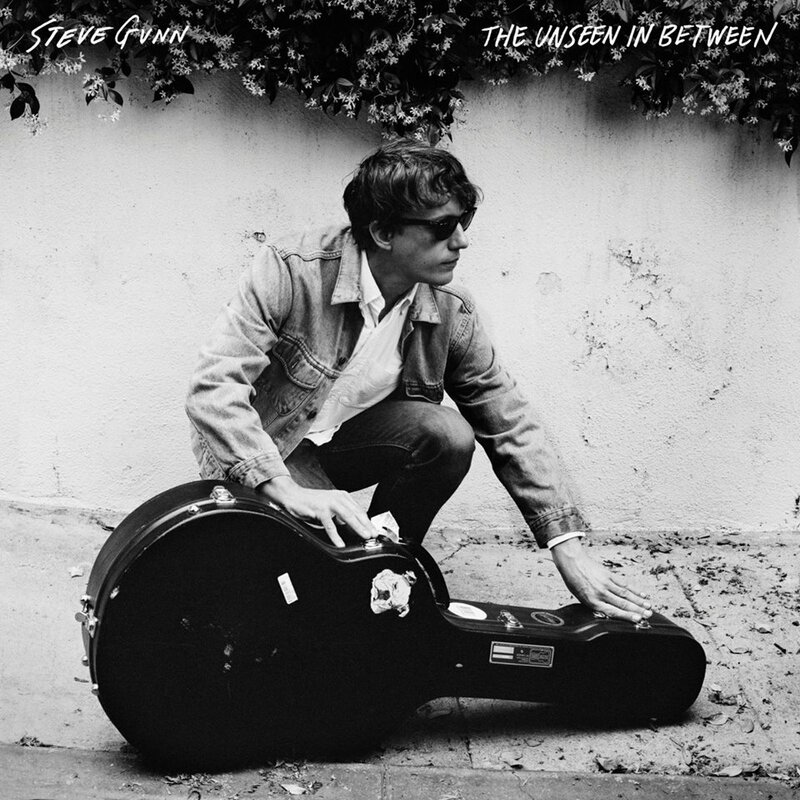 To me the artwork perfectly reflects the vibe of the songs on the album, and the album’s title, Cursus which refers to stories of life along the Neolithic courses which lead to the tallest standing stone in the UK, not far from where we live, at Rudston in East Yorkshire. There is a winterbourne stream in the Yorkshire Wolds – the Gypsey Race – which flows past he Rudston monolith. Like at Stonehenge there are courses – or cursus – huge miles long structures which lead from all around the surrounding countryside in straight lines to the stones. The final song on the album, “Night Heron” is about Welfare State International’s magical heron lantern installation on a boat there, and it happened just like the spoken word intro poem. It was part of the millennium Cityscape symposium which explored how art is good for the earth. It was wonderful, there was a huge paper heron, all lit up with fairy lights on a boat and a Gamelan instrument, a saron, on the boat. Exactly as the lyric goes, a gamelan tune faded into the distance as the boat was rowed to the far shore. At the time I was lucky enough to train as a Gamelan workshop facilitator with Manchester’s Halle Orchestra Gamelan and started to play with the Hull Honorific Sea Dragon Gamelan. The original demo was intended to accompany an art film. We used some gamelan instruments – the saron, slentem and gender – and explored different ways of playing them. When we recorded the song for the album Jeff imitated the Gamelan tune on his guitar, what a fantastic sound! I played with some great bands and met a few musical heroes when I was in Red Guitars and The Planet Wilson, both of whom had major label deals. We had a great time touring, mostly Europe, Scandinavia. A lot of people remember us supporting The Smiths on their first break though tour but my favourite gigs were at Berlin’s Loft in Metropole hosted by the legendary Monika Döhring, before the wall came down. But on the whole I prefer life as an independent musician, you can make your own choices and the whole thing is much more organic. We are planning a new Loudhailer Electric Company album, Underneath the Underground, and will continue to have lots of fun playing live. But we also have some of our friends’ albums to release on our DHM record label. Our next release is an EP by Dez Allenby. 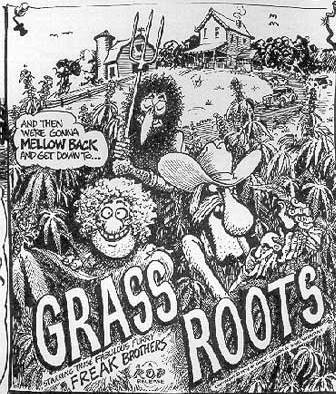 Dez was one third of the wonderful psychedelic acid folk band Forest back in the late 60s. Rich and I absolutely love Forest and I would cite “A Glade Somewhere” as one of my favourite ever tracks. Rich used to run a record and second hand bookshop – back in the original days of vinyl – and had a huge vinyl collection and vast knowledge of music as a result. He remembered Forest from when “A Glade Somewhere” was on the EMI Harvest sampler, Picnic – a breath of fresh air, with the likes of Roy Harper, Pink Floyd, Michael Chapman, Barclay James Harvest, Shirley Collins and Syd Barrett. We heard that Dez was living locally and invited him to come and play at Loudhailer Acoustic where he has become a regular performer. His EP features two fabulous songs, “1968 (and I was there)” and “We Sail Our Castles”. 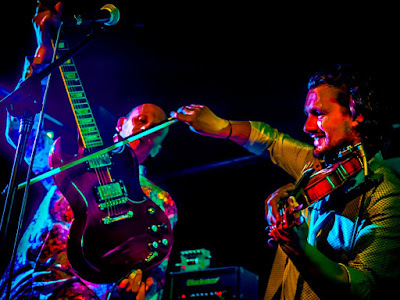 Another wonderful thing happened earlier this year – Dez got back in touch with his Forest band mate Adrian Welham who hadn’t played in public for 30 years. Adrian came and played at Loudhailer Acoustic and Rich and I put them both on at Filey Folk Festival where we were running stage. Adrian was fabulous, his new songs, like Dez’s are superb. It is very special to us that Dez and Adrian too come and play at Loudhailer Acoustic, and lovely that we have become good friends. The following release on our DHM label is the second album by electronica artist 4ourth 4loor – Past Lives. 4ourth 4loor is East Yorkshire electronic artist Andrew Tomlinson’s project. It’s dark and disturbing at times, full of ghosts and memories, but very danceable at the same time. 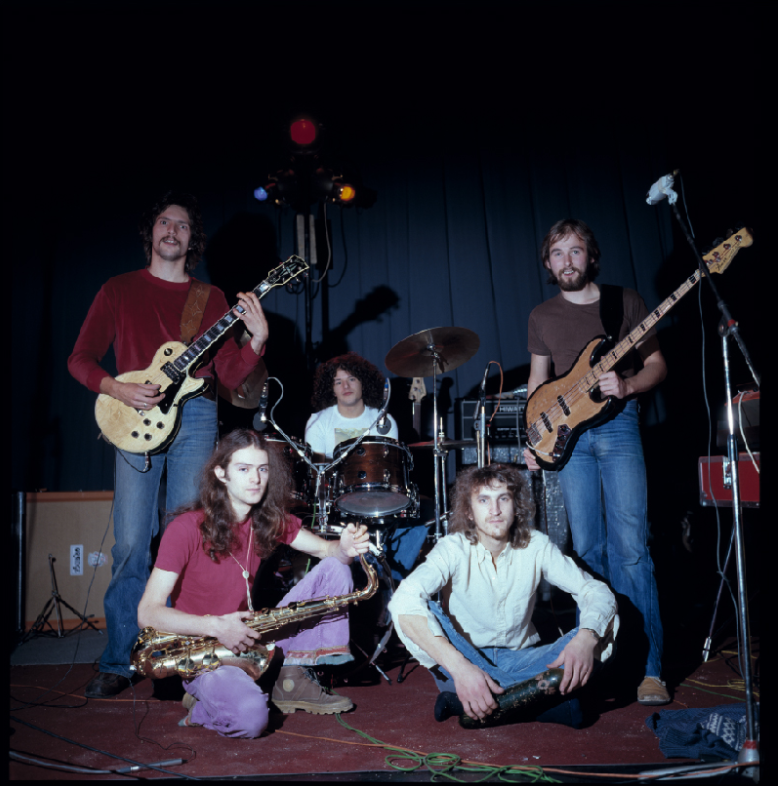 As a band we would probably cite American psychedelic bands, post punk UK bands, late 70s CBGBs, Gypsey jazz and North Mississippi hill country blues as our favourite music. Rich and I listen to the radio more than anything but love live music. We both love the North Mississippi Allstars – Luther and Cody Dickinson, sons of Memphis producer Jim Dickinson, look out for them – World Boogie is coming! Back in our home town the quality of people who come to play at Loudhailer Acoustic is a treat. Jim Orwin rarely plays anywhere other than Loudhailer Acoustic but his songwriting, lyrics, music and performance is really something. You can hear a pin drop when he plays, the audience hang on to every word. My number one favourite musician is the amazing maestro of the viola da gamba, Catalonian musician and musical archaeologist, Jordi Savall. He has made over 230 albums, some wonderful collaborations and music for world peace projects. We all love his music in our family, and have been lucky enough to see him play a number of times. We’d just like to say thank you Klemen and….keep it Psychedelic Baby! 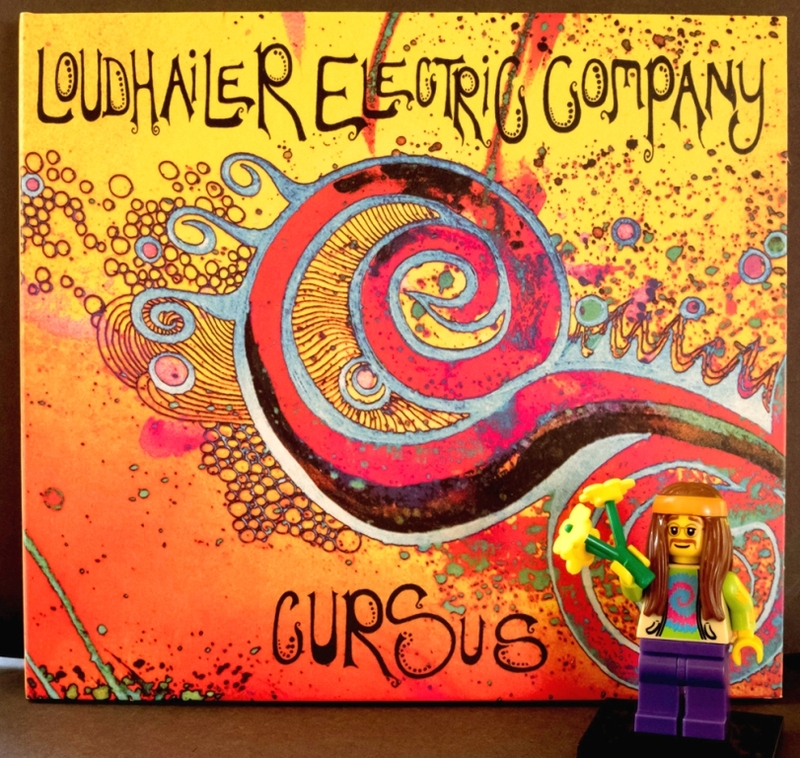 Loudhailer Electric Company debut studio album, Cursus, released on the DHM record label. Available from all the usual digital outlets including iTunes and Spotify; limited edition CD from selected stores, and Bandcamp. Thank you buddy, we are so chuffed to be in Psychedelic Baby Magazine amongst fab sounds and interviews galore, love it!